Hoarding of any sort poses significant health concerns for both occupants and nearby residents. These include fire hazards from extreme clutter, decaying or damaged electrical wiring, and blockage of exits from dwelling; lack of running water and electricity; infestation from rodents or insects; and the potential for spread of zoonotic diseases. Heavy accumulations of feces and urine can damage dwellings beyond repair, release a host of potentially toxic bioaerosols and gases into the air, and create odor problems for neighbors. Disease exposure could occur through inhalation, contact, or via vectors such as insects. Individuals who are immunocompromised or who have respiratory diseases may be at particular risk. Buildings may also become structurally unsound. For a recent review of these issues, see Castrodale et al, 2010. Sanitary codes in every community specify what constitutes a safe and habitable dwelling. Insisting on adhering to these requirements will improve conditions for people and animals. , which is a short but comprehensive instrument for quickly determining the level of risk posed to self and others, including animals.The HOMES scale can be downloaded here or from MassHousing Hoarding Resources. Air quality is a concern in animal hoarding situations. 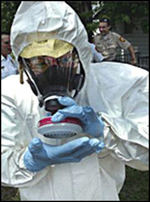 It is not uncommon for first responders to require respiratory protection during removal of the animals. The health dangers from the heavily polluted atmosphere in these situations are not well understood. The main components affecting air quality include gases such as ammonia and bioaerosols. Bioaerosols include a wide variety of inflammatory and physiologically active components, including endotoxin, fungal cell wall fragments, and dust particles that can reach lower airways. Ammonia is a known irritant of the eyes and upper respiratory tract at or below the exposure threshold of 50 ppm (parts per million) and represents a significant risk. The Occupational Safety and Health Administration (OSHA) sets a limit of 50 ppm for workers. In most workplace situations, this will be "pure" ammonia chemical in an industrial setting, not ammonia arising from decay of animal waste, which produces additional and potentially toxic respirable compounds. An ammonia concentration of 300 ppm is considered "Immediately Dangerous to Life and Health" by the National Institute of Occupational Safety and Health (NIOSH). Ammonia is produced by the decay of animal waste. Thus, failure to maintain sanitation will elevate ammonia levels. There have been reports of ammonia levels in unventilated hoarding situations exceeding 150 ppm. Any ventilation, even an open door or window, can dramatically drop measured ammonia levels (perhaps as much tenfold), so it is important that any measurements be taken prior to beginning an intervention. Under no circumstances should ammonia levels below workplace thresholds (25-50 ppm) be considered an indication of adequate sanitation in an animal facility. Commonly used hand-held meters used for worker protection have difficulty detecting ammonia in regularly cleaned shelters and kennels because levels are routinely below the threshold of sensitivity of the devices (less than 1-2 ppm). The role of bioaerosols is less well understood. Bioaerosols are difficult to measure, and these techniques are primarily available in a research environment. However, human exposure has been studied in other situations where there are accumulations of waste (livestock feeding and sewage or waste management facilities). This article describes some of the negative health effects caused by bioaerosols. Zoonotic diseases are those that can be spread from animals to people. Due to the wide variety of domestic, wild and exotic species that could be present in a hoarding situation, the list of diseases of concern is extensive. The CDC maintains a comprehensive database of these diseases. Poor sanitation, stress, poor health and lack of veterinary care make hoarding situations the ideal incubator for infectious disease. All forms of hoarding carry the risk of elder neglect, child neglect, and self neglect. Dependent or vulnerable adults or children are found in ten to 15 percent of hoarding cases. These are very actionable situations and can be reported to child welfare and adult protective services in every community. Persons working in animal protection, child protection and elder services should be cross-trained to recognize any of these forms of abuse. The American Human Association has more information about child neglect. Severe domestic squalor, which is sometimes referred to as "Diogenes syndrome," is defined as unsanitary conditions far exceeding somewhat unclean surroundings - conditions most people would find disgusting. Squalor can occur without hoarding, hoarding can exist without squalor, and both can co-exist. In situations where animals are hoarded, simply because of the accumulation of animal waste, squalor is more likely. It is possible for animals to be present in a situation where squalor exists, and to be at risk of suffering due to the unsanitary environment, but hoarding may not be a primary feature of the situation. Some of the same underlying traits that predispose a person to hoard may also contribute to their choosing to live in squalor. Careful assessment of the situation, including interview of the person, is important to assess whether animals are a primary feature of the case, or whether they just happen to be present in a situation that would otherwise still exist even if animals are not present. The government of New South Wales, Australia, has published guidelines for assisting persons living in squalor. 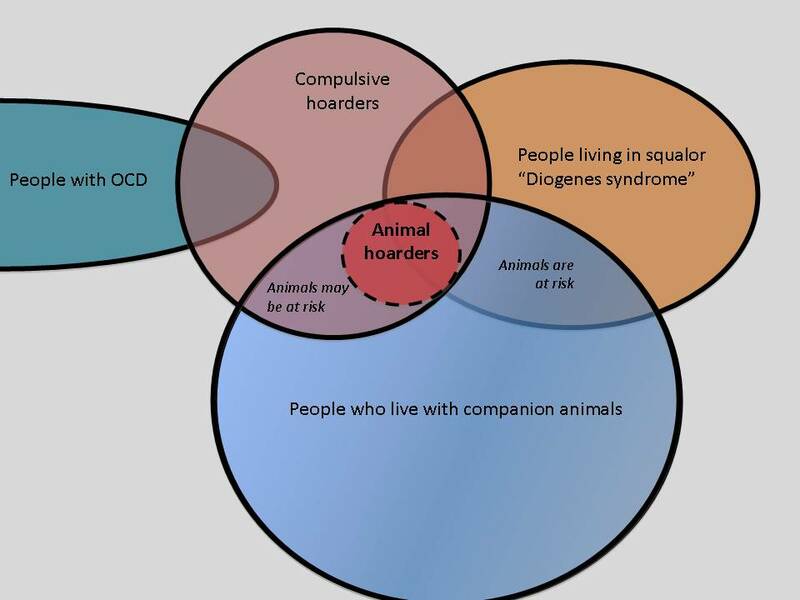 Animal Hoarding previously known as "collecting", is a poorly understood phenomenon which transcends simply owning or caring for more than the typical number of pets, and affects every community in the US. It has serious consequences for people, animals, and communities. New cases are reported in the media each day, with dozens of others unreported, and still more undetected. Animal hoarding is not about animal sheltering, rescue, or sanctuary, and should not be confused with these legitimate efforts to help animals. It IS about satisfying a human need to accumulate animals and control them, and this need supersedes the needs of the animals involved. Animal hoarding is a community problem. It is cruel to animals, can devastate families, be associated with elder abuse, child abuse, and self-neglect, and be costly for municipalities to resolve. Without appropriate post-intervention treatment, recidivism approaches 100%. Increased awareness, leading to more comprehensive long-term interventions, is needed. Details for over 1700 hoarding cases are archived on the website Pet-Abuse.com. This site provides a searchable national database for all types of animal abuse. Hoarding of any sort poses significant health concerns for both occupants and nearby residents. These include fire hazards from extreme clutter, decaying or damaged electrical wiring, and blockage of exits from dwelling; lack of running water and electricity; infestation from rodents or insects; and the potential for spread of zoonotic diseases.